So Why Do We Have a Board and So Many Rules? 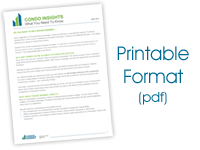 Surprisingly many Condominium Owners do not fully understand the reasons or requirements of their Condominium Corporation, their Board of Directors and their By-laws. The Condominium Property Act lays out legal requirements by which the Corporation must run. Since it is a Corporation, and different from the Corporation down the street, it must have structure by which to function – By-laws. By thinking in terms of one’s home or Unit, one doesn’t always see the overall Condominium complex as a whole in terms of a legal entity – a Corporation. By-laws are originally established by the developer and it falls to the Owners to make changes. By-law changes must be approved by 75% of Owners, and must be registered at Land Titles. Many people deciding to purchase a Condominium miss reading the By-laws, think the By-laws are simply a guideline, or feel frustrated later with the Board or Management Company for enforcing the By-laws. The Condominium Property Act is very clear about the relationship of an Owner and the Corporation’s By-laws. It states that the By-laws are a legal document which each Owner has agreed to abide by as if they had initialed each page. The Board of Directors, will set the policy of the Corporation on matters affecting enforcement of its By-laws and the control, management and administration of the real and personal property and the common property. Additionally the Board will direct the activities of the Management Company which reports directly to the elected Board of Directors. The Board will exercise their statutory duties under the Condominium Property Act and will delegate said powers as they see fit by a quorum of Board Members at a properly convened Board Meeting. It is important to note that all Board decisions are group decisions. The primary purpose of the Board of Directors is to meet to make decisions concerning the future direction of the organization. A Board Member must be prepared to attend meetings with the materials read, reports ready and a draft motion if they intend to make a motion. To ensure proper procedures and representation, both Board Meetings and Annual General Meetings (AGM) must have a quorum to proceed. A Quorum is a minimum number of participants stated in the Corporation’s By-laws.